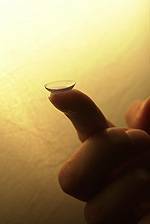 No single brand, material or design of contact lens is best for everyone. That is why we carefully listen to the needs and expectations of our patients before initiating the fitting process. Our large inventory of over 10,000 diagnostic lenses allow our Ventura patients to experience the benefits of contact lens wear often on the same day they are fit. From first time contact lens wearers to those starting to wear readers over their contact lenses,our extensive experience with multiple designs and materials enables our Ventura eye doctors to select and fit the right contact lens for your needs.